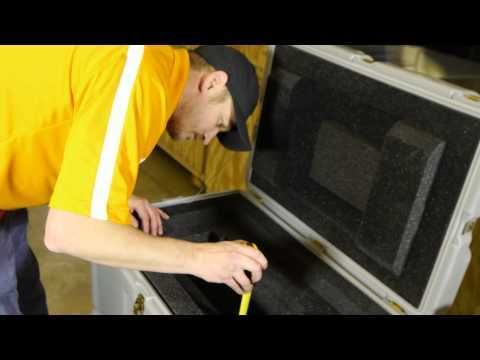 API provides equipment cases and containers to many government institutions such as the Secret Service, Dept. of Homeland Security, White House Communications and others. API’s cases and containers supply superior protection and convenient portability for all types of deployable equipment solutions, whether the equipment is weapons, communication equipment, work stations, or portable reconnaissance equipment API can design the perfect packaging solution. Our certified packaging engineers design and manufacture precision customized foam inserts guaranteed to securely hold and protect your sensitive equipment. API designs and constructs custom reusable shipping cases and containers to allow for fast set up and tear down for all types of communication components. Whether it is a large scale network, flyaway SATCOM system or portable identification system, API can work with you to help design the perfect solution. These cases and containers are designed to provide easy access with features such as ramp doors, hinged lids and lift off lids. These are all simple to operate and ergonomically friendly. All while being able to withstand long trips and harsh environments. API understands the importance of a system that needs to work within a case. This is why we have dedicated staff with extensive knowledge in the field of systems integration. API also works with engineering and machining groups to provide turn-key electromechanical integration solutions for fielding both portable and fixed site systems. See our Systems Integration page.